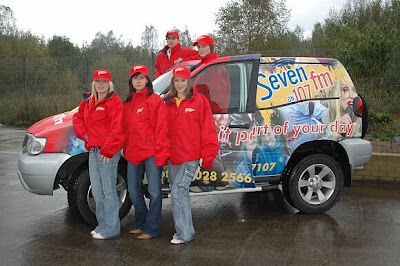 This radio promotion is for a new station in Northern Ireland. "Our emphasis is to provide a comprehensive news, sport and obituary service seven days a week". Community Radio in Ireland. Rosemary Day (Editor) (2007) Dublin: The Liffey Press This edited book provides an illustrated road map to the vibrant community radio movement in Ireland today. Written by people from all over Ireland who are actively involved in making community radio happen, the authors include volunteers, managers and regulators from the community radio sector. Organised in three sections, the book ranges from history, philosophy and reflections on best practice to the personal reminiscences of those who were actively involved in establishing radio stations in their own local communities. Section One charts the development of community radio in Ireland from its early days in the pirate era to the present. Section Two looks at the aims, issues and main concerns of community radio in Ireland today. Each chapter explores an area of major importance for community radio activists through the example of individual stations. These issues include the empowerment of marginalised people, adult education, the participation of women and the Irish language. Section Three is a delightful freewheel down memory lane, as the people who make community radio reminisce about the joys and difficulties of running a radio station where the people who listen can also have their say. Thanks to Salvatore Scifo for sending these reviews!